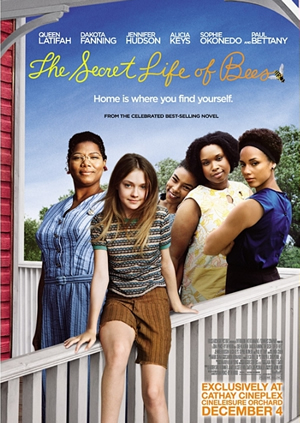 "The Secret Life of Bees," based on the New York Times best selling novel and set in South Carolina in 1964, is the moving tale of Lily Owens (Fanning) a 14 year-old girl who is haunted by the memory of her late mother (Burton). To escape her lonely life and troubled relationship with her father (Bettany), Lily flees with Rosaleen (Hudson), her caregiver and only friend, to a South Carolina town that holds the secret to her mother's past. 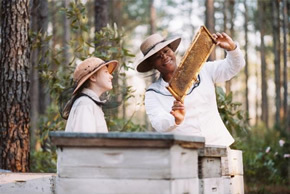 Taken in by the intelligent and independent Boatwright sisters (Latifah, Okonedo and Keys), Lily finds solace in their mesmerizing world of beekeeping. There was something we couldn’t get while watching this movie directed by Gina Prince-Bythewood. The chemistry between the cast contains this unexplainable force which we don’t usually see in other movies. It was only when the credits started rolling that we realized that the wonderful chemistry between the actresses resulted from a sense of involvement and belonging to the movie, and a large portion of it was probably due to the participation of superstars Will Smith and his wife Jada Pinkett Smith as the producer and executive producer of this movie. It was probably a sense of community which translated to the brilliant chemistry between black actresses Queen Latifah, Jennifer Hudson, Sophie Okonedo and Alicia Keys. Based on American writer Sue Monk Kidd’s New York Times bestselling novel of the same name, Prince-Bythewood brings together a godsend cast of actresses to tell the story of a young white girl who lives on a peach farm with her violent father. Because of a terrible accident that happened when she was young, a caretaker is hired to look after the young girl. 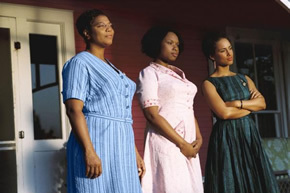 When the black woman offends a group of racists, the two ladies are forced to leave the town and find themselves in another town with three black sisters who own a bee farm. It is there the young girl will find out the truth behind her mother’s death. The plot obviously makes for great novel material, considering the rich themes of loneliness, the search for true identity and more academic subject matters such as civil rights, religion, racism and feminism. But when these are visualized on the big screen, it becomes something which viewers may have seen somewhere before. Who hasn’t seen the story of a young girl seeking out the story of who her dead mother really was? Who hasn’t seen the story of a group of black women standing up for each other in a racist community and making sacrifices along the way? And who hasn’t seen the story of a protagonist feeling the need to be needed and understanding what it’s like to have a real family? There are not many surprises in this 110 minute movie (you can predict the plot development around every corner, and extra points if you can predict the inspirational dialogue spouted by the characters every time something dramatic happens), but what stands out is, as mentioned earlier, the spot on chemistry between the cast members. Queen Latifah (Hairspray) leads the gang with her grounded and sure footed performance. Her portrayal of the mother of the hose brings warmth and sentimentality to the movie. Oscar Best Supporting Actress Jennifer Hudson (Dreamgirls) plays the caretaker and proves that she isn’t only good at crooning. After belting out the Bond theme song for Marc Forster’s Quantum of Solace, Alicia Keys (Smokin’ Aces) has another go at acting to play the angry elder sister of the family. Sophie Okonedo (Hotel Rwanda) plays the intellectually challenged younger sister who steals the show with her tear inducing role. Rounding up the ensemble is Dakota Fanning, who has grown nicely since her days in I Am Sam (2001) and The Cat in the Hat (2003). The child actress has abandoned her cuteness for a more matured acting approach, and earns her own place beside the more experienced actresses. Together with the shining black actresses, and Paul Bettany and Hilarie Burton who have brief screen time as the girl’s real parents, this ensemble took home the award for “Ensemble Acting of the Year” at the Hollywood Film Award, and that is probably what you’d be looking out for when you watch this movie.